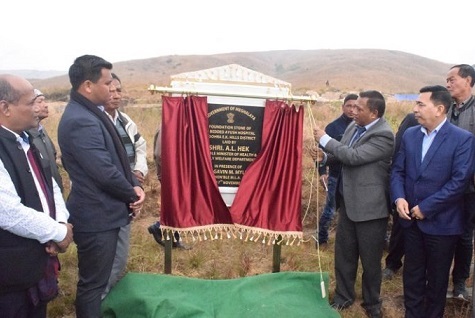 Meghalaya Health Minister A L Hek on Saturday laid the foundation stone for the construction of a 50-bedded Integrated AYUSH Hospital at Wahshari in Sohra (popularly known as Cherrapunjee) in Meghalaya. Speaking on the occasion, the State Health Minister expressed happiness that after years of continuous efforts and proposals, the Ministry of AYUSH under the National AYUSH Mission has allotted sanction for the setting up of two hospitals, one in Sohra and the other at Ri Bhoi District. He highlighted that the motive behind selecting Sohra as one of the centres was that the Government wanted to promote the concept of health tourism. Sohra, he said, is adorned with a natural scenic beauty known throughout the world making it as one of the most sought tourist destination attracting visitors from around the country and the world over. Hek also stressed that through this centre, the practice of local and traditional healers would also be integrated with the AYUSH programme which will help to revive and promote the ancient and traditional methods of healing. The foundation stone was laid in the presence of Sohra MLA, Gavin M Mylliem, Mawsynram MLA, H M Shangpliang, Sohra MDC, Donovan Kharwanlang, Secretary (Health) P Bakshi, Syiem of Hima Sohra, Freeman Syiem, officials from the Health department and other dignitaries.